Emporium Rotary held its 15th Annual Wine and Cheese Fundraiser Saturday which benefits Rotary’s scholarship fund. The yearly highlight of the event is the homemade wine competition. This year’s event was broken down into three categories – Red, White and Fruit/Other Wine. 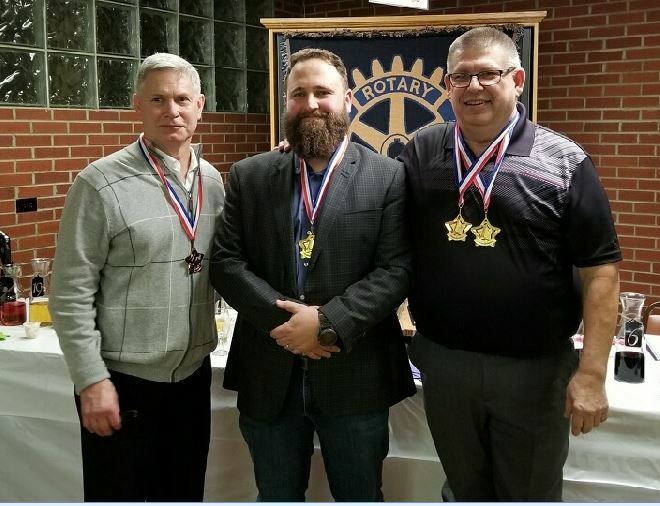 Winning in the red wine categories were: 1st place – John Frantz; 2nd place – Ryan Magaro; 3rd place – Blair Lundberg. In the White Wine category, the winners were: Ryan Magaro took 1st and 3rd place and Pete Fragale took 2nd place. In the Fruit/Other Wine category, 1st place was John Frantz; 2nd place, Pete Fragale; and 3rd place, Dave Smith. Shown are several of the night’s winners (l to r) Blair Lundberg, Ryan Magaro and John Frantz.